Good news, folks who are playing Pokémon Omega Ruby or Alpha Sapphire. There's a free legendary 'mon with your name on it right now. All you have to do is start up your game of Pokémon, and select "Mystery Gift" on the main menu. From there, choose "Receive Gift." You'll have to connect your 3DS to the internet, and once you do, you can choose "Get With Code." 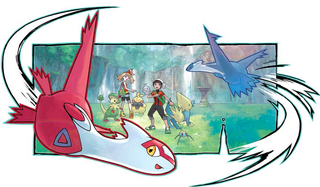 On this menu, input "2015LATIOSLATIAS" if you're in North America, or "POKEMON380381" if you're in Europe. The game should tell you about a ticket that you're supposed to take to Petalburg Gym. Download it. With this, you'll be able to download either Latios or Latias—whichever legendary the game doesn't normally gift you during the storyline. This way, you can have both! Neat, eh? ...that should take you to an island containing whatever legendary you don't have. Awesome. According to Serebii, the promotion lasts until March 2nd, so get on it while you can!